Two key factors must be considered when specifying the colour of a fluorescent tube - the correlated colour temperature (CCT) and the colour rendering index (CRI). The colour temperature is largely a matter of personal taste. The general preference is to use cool colours for a business-like atmosphere (e.g. in offices, factories, shops) and warm colours for a social atmosphere (e.g. in hotels and the home). However there is considerable variation between different countries in terms of the most popular fluorescent light colour. The clear favourite in both continental Europe and North America is 4000K Neutral White. In the UK however the preference is for 3500K tubes, which strikes a balance between creating a professional atmosphere whilst providing a feeling of warmth for a friendly working environment. In the colder climes of the Nordic countries the 3000K lamps are preferred, to provide a feeling of warmth when coming indoors. Conversely the hot conditions in Southern Europe lead their populations to prefer a cold colour light, which provides the perception of escaping out of the heat into a cool and comfortable interior space. In all of these countries however, the warmest 2700K tubes hold court in domestic and residential lighting where they come close to the favoured appearance of the dominant incandescent and halogen lighting. These local preferences are contrasted strongly by practically the whole of Asia, where practically all sales are for the cool daylight lamps of 5000-6500K, even for residential lighting. 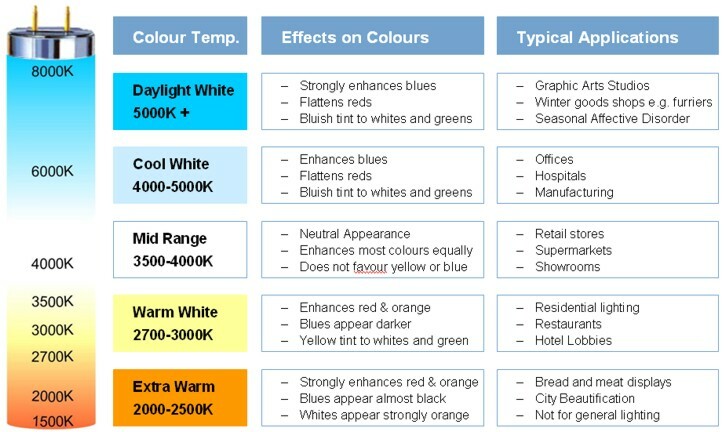 Some more detailed applications for the different colour temperatures are detailed in Figure F2. When choosing the desired light colour it is crucial to stay within the boundaries of the empirically determined Kruithof diagram (Figure F3), so as to achieve a natural colour appearance. The use of high colour temperatures at low illumination levels results in a depressing visual environment where colours appear flat and dull. Conversely the use of warm colour temperatures at high illumination levels yields an unpleasant insipid yellow hue to the surroundings which disturb the feeling of well-being. The matching of the illumination level to the desired colour temperature is a key point that is often overlooked in modern lighting design. With the launch of the first fluorescent tubes, the choice of colours was restricted to a single shade of 'White' plus seven vibrant colours. The white was a neutral colour having a CCT of around 4000K. Soon this was joined by a lower colour temperature known as 'Mellow' or 'Warm White'. This was rapidly followed by a high colour temperature light intended to better match the 5600K of natural daylight, and these lamps were simply called 'Daylight'. During the 1950s and in particular following the invention of the halophosphate materials, dozens of additional shades of white made their debut, and these were later augmented by the so called Deluxe colours - which offered the same colour temperature as earlier tubes but with superior colour rendering properties. Around this time most manufacturers adopted a coding system in which a completely arbitrary two-digit number was introduced to define each colour. This situation propagated until the early 1990s, by which time there was quite some confusion in the market. This was not only because of the great number of different colours and codes, but also because each manufacturer and global region had its own nomenclature. The situation was rationalised following the introduction of a highly logical three-digit colour coding system by GE-Thorn in 1990. Such was the simplicity of this system that during the rest of that decade it was adopted by most other manufacturers, and also extended to other discharge lamps. 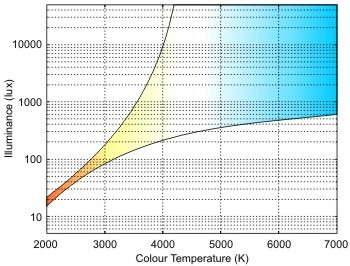 The general structure is illustrated below in Table F2, where the first digit defines the colour rendering group while the second and third denote the correlated colour temperature. Some manufacturers continue to dual-brand fluorescent tubes with their original two-digit serial codes in addition to the modern 3-digit system. There is no logic to these older codes and they cannot be deciphered to reveal the colour properties without reference to the manufacturer's literature. A fairly comprehensive cross-reference table of both historic as well as modern fluorescent colour codes from the key manufacturers is provided below in Table F3.